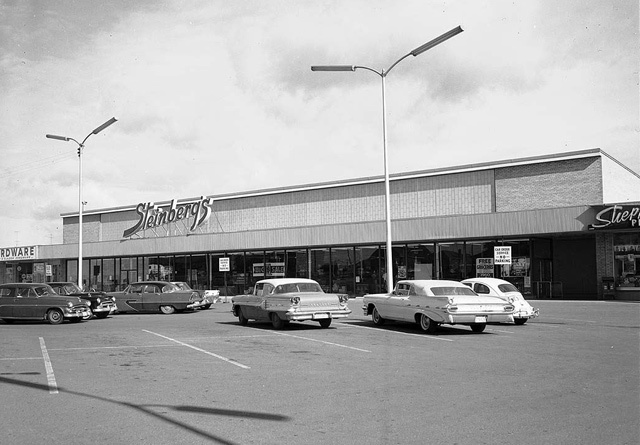 Steinberg’s supermarket, Bathurst Street and Sheppard Avenue West, 1960s. City of Toronto Archives, Fonds 1257, Series 1057, Item 6543. Among the properties the city nominated for heritage designations last month, one that garnered attention was the Metro supermarket at Parkway Mall in Scarborough. Since its opening over fifty years ago, the store under the graceful arch has carried a number of nameplates, from an American chain making a brief foray north of the border to a Quebec powerhouse brought down by family bickering. Though the Grand Union, Steinberg’s and Miracle Food Mart names have long departed from this store and the rest of the city, combined they were key players in the cutthroat grocery trade for four decades. Advertisement, The Toronto Star, August 8, 1954. 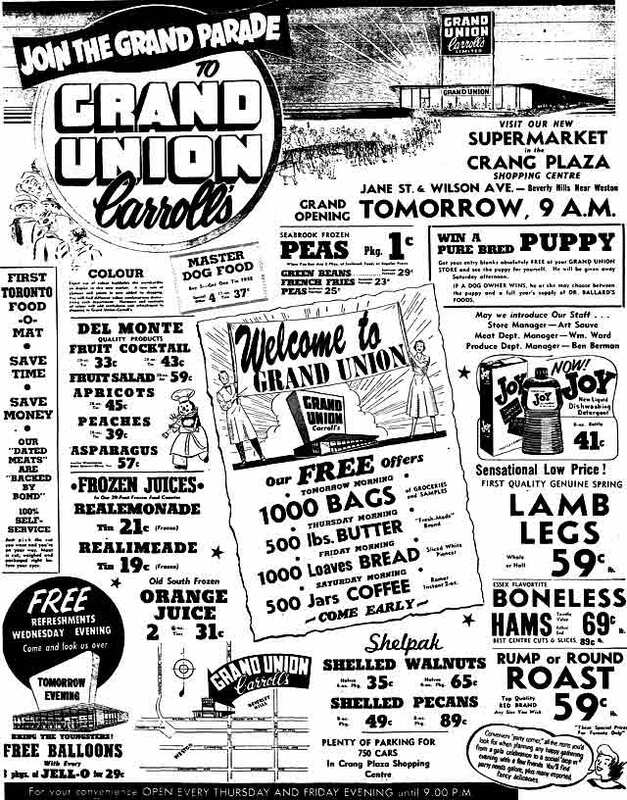 In May 1953 growing New Jersey–based supermarket chain Grand Union purchased Carroll’s, a Hamilton-based group of grocery stores. 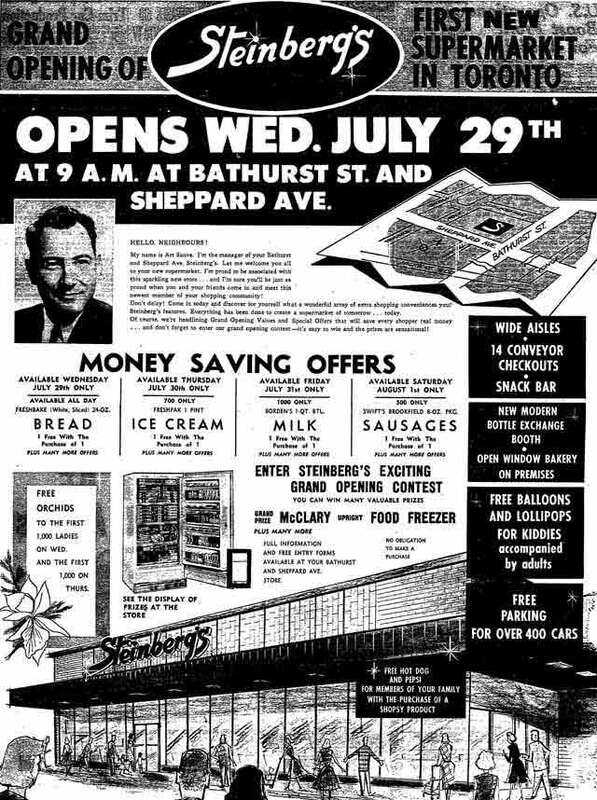 Their first major Toronto location opened, with the lure of a free puppy, in Crang Plaza at the northwest corner of Jane and Wilson in August 1954, which is still in operation as a Food Basics. By the end of that year, the company announced its participation in a multi-million dollar development at Ellesmere and Victoria Park, which took four years to come to fruition. Advertisement, The Toronto Star, September 3, 1958. 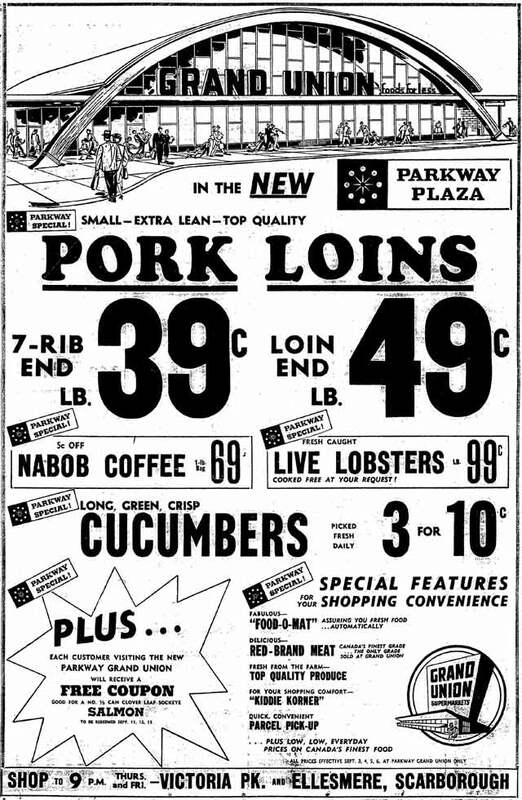 Parkway Plaza opened on September 4, 1958 with many distractions for shoppers, including a forty-six-piece marching band, bagpipers, funny (not scary) clowns, and live radio broadcasts by CHUM and CKEY. The curved used for the Grand Union was a hot style for grocery stores of the period, notably Safeway’s “Marina” design. A similar arch was used further west at Grand Union’s Yonge and Sheppard location—later renovations to that site squared off the front of the building, but a quick look up in the present-day Metro store reveals the original design. Parkway Plaza proved to be the last grocery store to open in Metro Toronto under the Grand Union banner. Deciding to focus on expansion south of the border, Grand Union sold its thirty-eight Canadian stores to Montreal-based Steinberg’s in June 1959, a move that President Lansing P. Shield felt was “a natural move which will benefit stockholders and employees of both companies.” Grand Union would go through alternating periods of expansion and contraction until several bouts of bankruptcy under a revolving door of owners reduced the chain to a handful of small towns in the northeast. Advertisement, The Toronto Star, July 28, 1959. Advertisement, The Toronto Star, January 15, 1969. In January 1969, all Toronto Steinberg’s stores changed their banner to Miracle Food Mart, a name that incorporated the name of the company’s discount department store chain to convey a new lower price policy. A Steinberg’s spokesperson told The Globe and Mail that the changeover was a “direct response to the needs of the majority of today’s food consumers and the problems they face in meeting the rising cost of living.” That rivals such as Loblaws saw their sales rise after dropping expenses such as trading stamp promotions probably provoked the move more than a feeling of sympathy for shoppers. The 1970s were marked by continued expansion, charges of false advertising, recurrent labour strife and constant price wars with A&P, Dominion, and Loblaws. Few weeks went by without one story in newspaper business sections about wide-scale price drops or brief attempts to hold back the rising cost of meat. By the end of the decade there were twenty-four locations within Metro Toronto, though only two stores were within the old city (College Square and Gerrard Square). You would buy meat from where the quality is guaranteed by the King of Kensington, right? 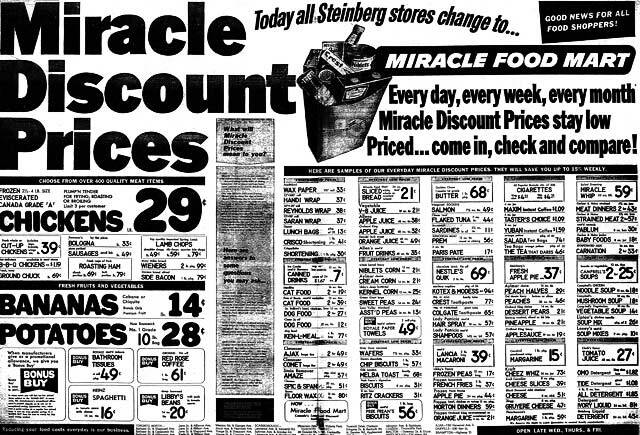 The 1980s saw Steinberg enter the “super-combination” race among grocers to dazzle shoppers with larger stores offering wider merchandise choices such as small appliances and television sets, later followed by food-drug stores under the Miracle Ultra banner. Miracle’s local market share decreased sharply mid-decade when A&P purchased Dominion’s Ontario assets and Oshawa Group picked up Safeway’s local stores. What doomed the chain was a nasty family spat among the Steinberg family, specifically sisters Marilyn Steinberg Cobrin, who ran the family trusts, and Mitzi Dobrin, who had served as a corporate executive. The family divided amidst attempts by one faction to oust the other, the squabbles revealing long-simmering jealousies between the sisters that newspaper reports suggested only their hairdresser knew the true depths of. By 1989, with the intervention of the Quebec government, the corporation was sold to a consortium led by Socanav and the Caisse de dépôt et placement du Québec to prevent a sale to Toronto-based Oxdon Investments, who only intended to keep Steinberg’s real estate interests (the province wanted the corporation to remain whole and in Quebec hands). Naturally, the new owners carved up their acquisition. After several months on the block, the Miracle Food Mart division was sold to A&P Canada in July 1990. The name gradually faded away from the city over the next decade, though the Ultra name lingered on in markets like Burlington and Guelph until the recent conversion to the Metro banner. 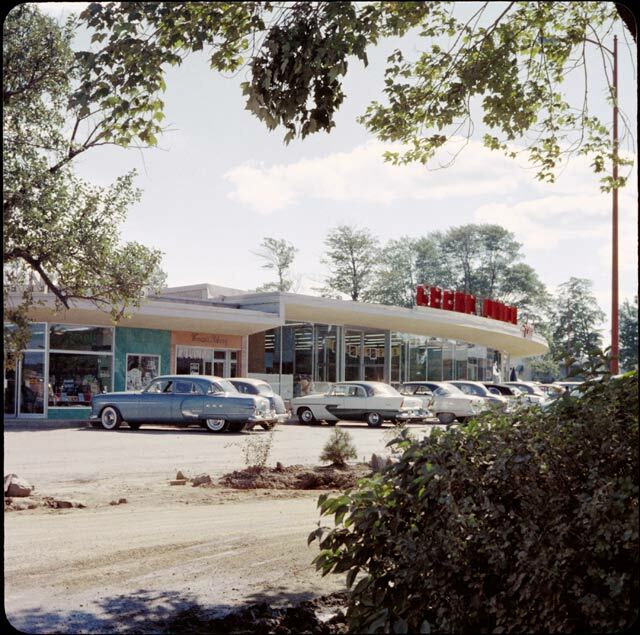 Thorncrest Plaza, c. 1956. City of Toronto Archives, Fonds 213, Series 1464, File 1, Item 16. Besides those already mentioned, Grand Union locations still stand at Islington and Rathburn (now an IGA in the curving, petite Thorncrest Plaza) and at Browns Line and Evans (currently occupied by Top Food Supermarket). Additional material from the June 11, 1959, January 14, 1969, and February 16, 1988 editions of The Globe and Mail and the July 8, 1959 edition of The Toronto Star.